http://traffic.libsyn.com/creatingwellbeing/CWBHappiness_born_of_ReverieFinal_-_5117_5.49_PM.mp3 When I was little and living in lush, sweaty Georgia, my mother would take me and my brother out to the lawn and we’d pick delicate white daisies, carefully connecting stems end to end to make a halo or a crown. Secluded from other cares, for me those afternoons before being called to dinner felt eternal, endless. We didn’t ask to watch TV, the only screen available back then. And if we were lucky, the day would turn dusky and bands of lightning bugs would appear, making their mystical dance around our heads, flying just low enough so we could catch a few in our glass jars. I always released mine after a few seconds, hoping they would remember me as kind and come back again the next evening. Daisies don’t grow in the grass in California where I live now. Bugs do. They crawl up and down gigantic blades in a determined march to get to the other side of the lawn. When my twins were little, we’d get down on our forearms and elbows and watch their surprisingly fast journey. Then we’d roll onto our backs and look at the clouds, finding comical animals, monsters, and castles. Absorbed in our thoughts, time moved much slower than the clouds and bugs. When my husband called us to dinner, we strolled to the house, calm and happy. Several years ago, we tore up the grass to save water. 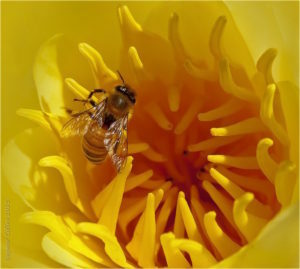 I don’t see the bugs up close now, but I see the honeybees and hear their sweet music, along with the birdsong. Long before Gautama became enlightened while sitting under the Bodhi tree, he experienced a calm, peaceful reverie as a boy while sitting under a rose-apple tree in his father’s field. This Buddha-to-be watched the grass being churned in the fields and noticed the bugs being displaced by the plow, some dying and some surviving. Contemplating the transitoriness of life with calm awareness, he experienced the state Buddhists refer to as jhana—a rapture and pleasure born of seclusion from the usual demands of life. This glimpse was lost in memory for many years, until that day under the Bodhi tree when Gautama realized that life brings suffering, yet it also brings a way out. Meditation is one of the paths that bring awareness, insight, and calm. These states of meditation where the mind is free from craving, aversion, sloth, agitation, and doubt, are experienced when we can be alone without demands of daily life pressing us toward the ever-present distractions that impinge daily. Watching clouds or bugs with nothing on your mind may bring about that first state of meditation, just as it did for Buddha. Taking time with no purpose, but to sit still, listening and observing, may bring surprise and joy. Where meditation helps to get me to a place where I can focus on one thing instead of many, what steps can I achieve and foster resilience? By this I mean, reframing the negative thoughts so that I believe the “new story” and remain positive even when the new story doesn’t produce a positive outcome. Lucia, This is difficult to answer in terms of meditation, in that when practicing mindfulness, we don’t try to make negative thoughts positive, but accept that during meditation, we will have a range of thoughts that include negative, or difficult, and pleasant thoughts. The challenge is to accept them as they come into mind, and then not cling to them or get caught up in the thoughts. By re-focusing on the breath, (or whatever the meditation focus is) we gradually change the way we relate to all thoughts, including negative ones. This will produce resiliency. Thank you for your thoughts. This is a very important question, with no easy answer.